Dressed up for the holidays, ginger and chocolate kiss in one beautiful Ninja Santa cookie. Over low heat melt the butter in a large pan. Dissolve the brown sugar and the molasses in the melted butter. Cool. Pour into a large bowl. Whisk in the egg. Add the flour, baking powder, baking soda, pumpkin pie spice, ginger and cake spice to the large bowl. Combine well with a wooden spoon or Japanese shamoji rice scoop. (Avoid tough cookies: Do not over mix and stay away from the electric mixer.) Stir in the mini chocolate chips. Divide the ginger chocolate cookie dough in half. Shape into medallion disks. Refrigerate overnight. Bring the dough to room temperature. Roll out the dough to a ¼ thickness on flour covered cutting board. Cut out the ninjas on a flour covered board. Place on parchment covered cookie sheets. Sprinkle with cocoa. Freeze for 2 hours or more. Bake the cookies in a 350 degrees oven for 12 to 15 minutes. Cool. Knead red food coloring into marzipan. Roll out into ¼” thickness. Cut out Santa cap triangles. Whip up the vanilla frosting with the powdered sugar. Pipe buttons and Santa cap lining with a writing tip. 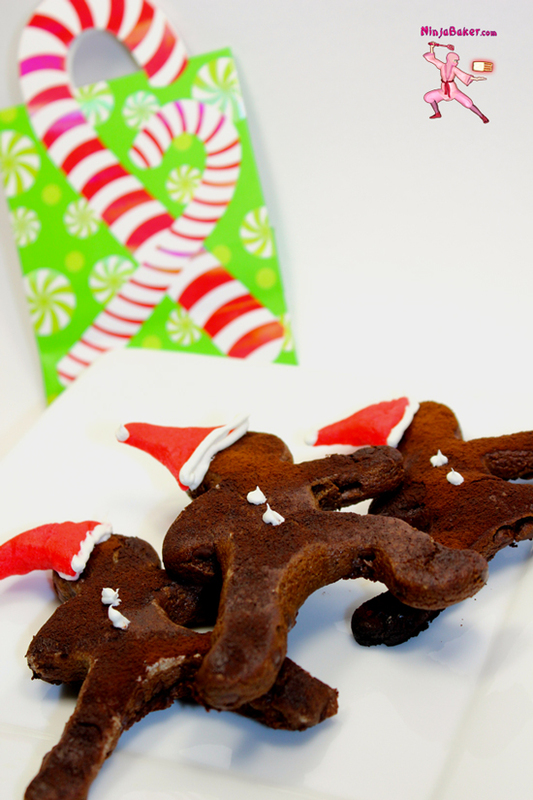 You can use the same frosting to attach the Santa hats to the ginger chocolate cookies.